Many opt for silver instead of gold due to the “magical” gold / silver ratio (the gold / silver ratio is calculated by dividing the price of gold by the price of silver). They then point at the “historical” 16:1 ratio as a “fair estimate” of the mean ratio, and predict a “regression to the mean” of silver against gold. As the gold / silver ratio currently hovers around 65:1, silver will outperform gold by miles, or so the thinking goes. While there are many good reasons to invest in silver, investors shouldn’t rely on the gold / silver ratio in their decision to buy either gold or silver. First the good news: from 1971 to 2011 — when gold was dethroned as world reserve currency —the correlation between gold and silver prices was 0.878, whereas the correlation between gold and commodity prices (we used the Goldman Sachs Commodity Index as a proxy) was 0.862 over the same period. The correlation between the prices of primary metals and gold was even higher. Indeed, silver prices have followed gold prices upward in the commodity bull market of the 70s, and then again corrected downward together with gold in the 80s and 90s. Since 2000, as we’ve entered a new bull market in commodities, silver prices have more or less risen in line with gold prices. Gold and silver generally go hand in hand, at least in the long run. The relationship between gold and silver holds firm to such a degree that investors can select one of both (or both) for exposure to the commodity and precious metals market. However, on many occasions the two prices significantly diverged. Why do gold and silver diverge and how does this affect the investment decisions that we make? Since 1972, gold and silver prices have fluctuated (more or less) freely. Before that time, the ratio between gold and silver prices was fixed, which actually led to what we now call the “Law of Gresham”, which explains how governments have, by fixing the ratio, de-monetized silver entirely. By overvaluing gold to silver, silver was taken off the market and sold elsewhere; arbitrage trading flourished while silver disappeared. Not anymore; gold and silver prices are for the greater part freely set by the market, although no longer as a medium of exchange. Gold and silver (or better yet, commodities in general) have moved cyclically since Nixon severed the US dollar's tie with gold. Their prices are no longer set by governments decree, but now depend on real supply and demand. That said, the dynamics of supply and demand between gold and silver differ immensely. Gold demand depends mostly on investment demand, whereas silver demand consists for the most part of industrial demand. So, the gold / silver ratio was fixed in ancient times. Yet, according to the proponents of the gold / silver ratio, the ratio still moves to some mean. This mean, its defenders say, is based on the historic price levels of both metals since 1792, when silver was still part of the bimetallic monetary standard of its day. The prices were fixed by the government: for every ounce of gold the government would give you 16 troy ounces of silver. The prices were “anchored”, bypassing the market, by bureaucrats. Yet, there is no logical reason for the gold / silver ratio to regress toward a mean. For instance, competition drives down profits and profit margins. When some industry enjoys a generous margin, competition (if not impeded) moves in and lowers the profits of the existing players. Hence, whenever we see sky-high profits or margins in some sector of the economy, we can logically expect a “regression to the mean”. The gold / silver ratio has no logical counterpart. Investors might move into silver, especially when a currency crisis erupts, but they just as well might not. Although empirically we see some relation between gold and silver, there is no economic law that states that gold and silver will regress to a magic 16:1 ratio. Gold actually outperformed silver in most of the bull market of the 70’s, when both metals reached historic highs. Only in 1980 — at the peak of the bull market — did the return on silver outrun gold. Remember, this was the year of the famous silver corner of the Hunt brothers. Then, and only then, did silver outperform gold in the last secular bull market. Silver was “the better choice” for a mere six months in a period of ten years in the 70’s. 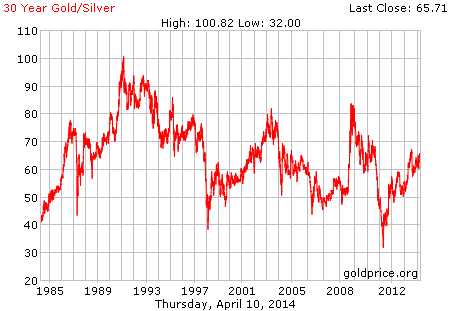 Silver did, nevertheless, outperform gold from 2009 to 2011, among some other periods before the Great Recession. This outperformance came with a price, though, as silver prices collapsed afterwards to an extent far greater than the correction in gold prices. Where Is the Gold / Silver Ratio Now and Where Is It Heading? It is a possibility, but not a logical certainty, that the silver price will rise in line with gold. However, when and if we experience an economic slowdown, silver prices might remain under pressure for some time to come. Just as in 2008, when the gold / silver ratio rose to over 80:1, silver prices were hammered due to lower industrial demand, whereas gold surged due to the uncertainty in the markets. A similar divergence might occur again, with the gold / silver ratio going substantially higher before coming down once again. I’ve said it before and will say it again: silver is a completely different ball game. If an economic slowdown occurs, silver prices will remain under pressure for the foreseeable future. The demand for computer hardware, for instance, has been disappointing recently, and the outlook remains frail for the coming years. Hence, any upward movement of silver prices will be mostly driven by an increased investment demand. And that demand might be a long time in coming. The substitution-effect we’ve discussed before might come to pass only when gold prices are already a lot higher. The higher the gold price, the higher the correlation with silver. It is a “substitution-effect”, about which I’ve written before, as government price distortions (by taxes or import duties) can stimulate this replacement-effect from gold to silver, as is actually happening in India. Silver will one day become “poor man’s gold” again, but in all likelihood at a moment gold prices are much, much higher. Investing in gold is, perhaps, more suitable for the masses, as its costs are lower and its demand not dependent upon worldwide industrial production. Yet, whoever expects a shift in investment demand for silver, might as well profit from currently low silver prices and perhaps even lower silver prices down the line.